Party in the Garden, Orphan Seedlings Need Homes! It often happens as we work in our offices, cubicles, clinics and units that we get stuck inside for hours on end with nary a sign of land or sky. The chain to our desks or patient bedsides makes the great outdoors seem as distant and mythical as Narnia or Hogwarts. So how do we get a little more grounded? 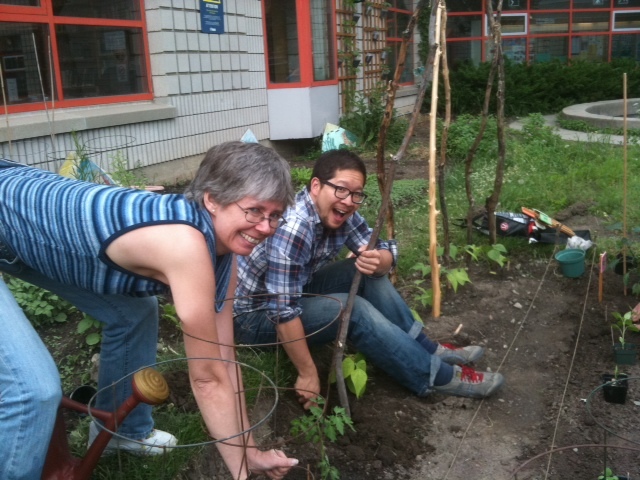 Enter stage left, the UHN Real Food Garden, a brand new program going through its first year of sowing and growing. 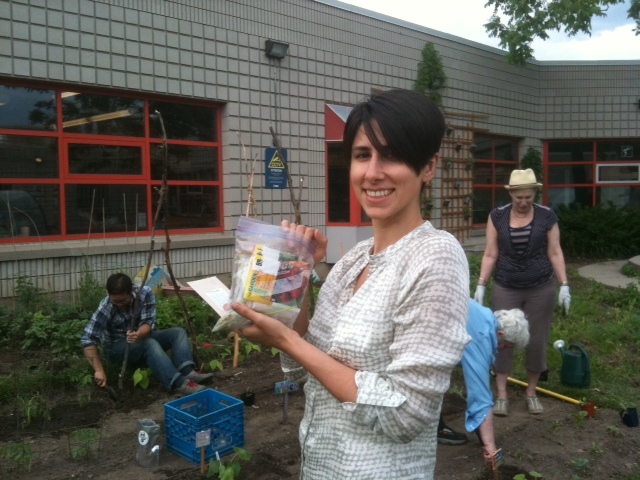 The UHN Real Food Garden is an amazing seed to feed program run by UHN staff volunteering any moments of extra time to plant, weed, seed, and water our little plot of land. How wonderful for a lab tech to talk to actual people and other living things instead of endless streams of test tubes. Or for a nurse working the midnight shift to see daylight and get her hands dirty (if you work for Infection Prevention & Control, don’t panic, she will wash them well before handling patients). And if this couldn’t sound better, it is! The fruits (and veggies) of our labour will be used by the ELLICSR Program to teach cancer survivors to cook and eat healthy meals. That’s everything good in one fantastic program…sunshine, lollipops and rainbows everywhere! You’ll be happy to know that the money made by our UHN Green Team selling Trees for Toonies on Earth Day went to buy organic compost/fertilizer for the new UHN Real Food Garden. After planting as many seedlings as we could, we need homes for the poor lonely extra seedlings. What a great reason to have a party, even better, a party outside! Pick up these seedlings for your garden at home, and any money made will go back into the UHN Real Food Garden. A Garden Party & Seedling Sale! 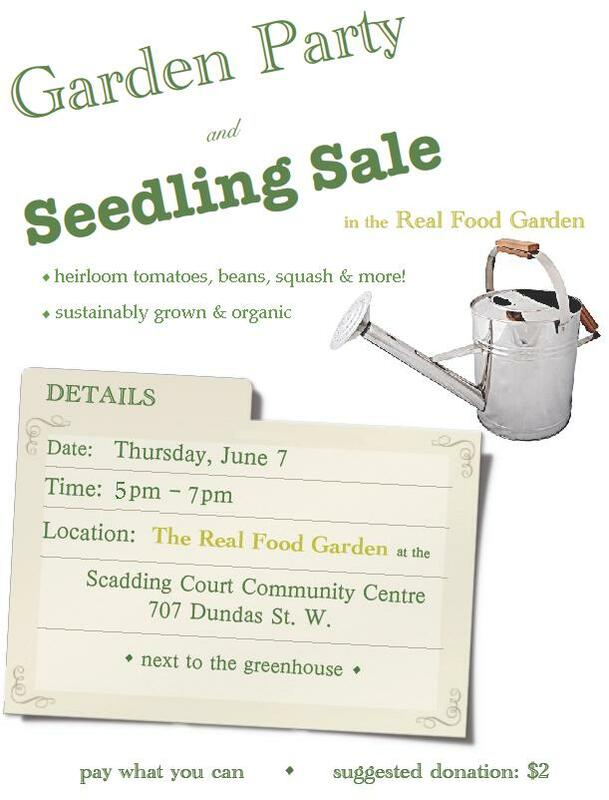 Location: The Real Food Garden next to the Green House, Scadding Court Community Centre 707 Dundas St. West, across from Toronto Western Hospital. This entry was posted in Beyond Talkin' Trash, Events and tagged garden, seed to feed, seedling, trees for toonies. Bookmark the permalink. ← Bike to Work Week is Next Week!